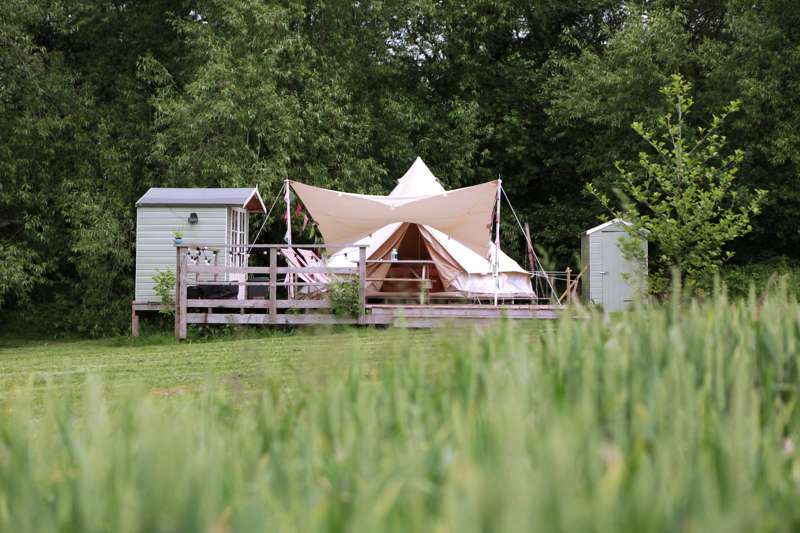 This is a spacious six-metre canvas fully-furnished bell tent that comfortably sleeps up to four people. You will find one double and two single beds made up for your arrival with bed linen, duvets, pillows and blankets all provided. 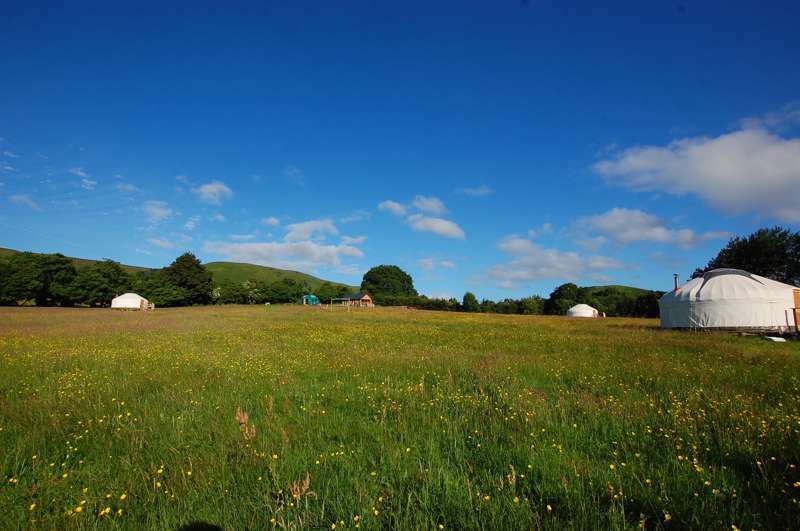 The Bell Tent is located in it's own flower field with a panoramic view of the Black Mountains. A warm welcome awaits at our campsite in the mountain wilds of the Welsh Marches in Herefordshire. 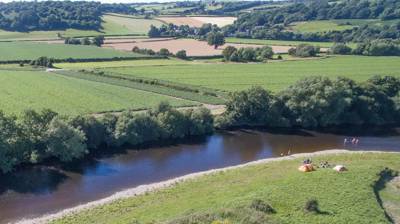 Campers seeking peace and tranquility at this hideaway in the little village of Craswall close to the book town of Hay-on-Wye can choose a pitch in 15 acres of wildflower fields bordered by ancient woodland, or why not book our airy, fully furnished bell tent. Children can make dens, run in the woods and play games in the long grass. Pizza is available, usually one night of the week, from the original farmhouse bread oven and is made using mostly our own farm-grown ingredients. We also offer salad and vegetables from our polytunnel and eggs from our chickens. Grownups can choose a local beer or cider from our tiny shop, light a fire in one of our fire pits (firewood and kindling available from the shop) and watch the stars. The pastures are a spectacle throughout the spring and summer with a show of bluebells and a host of other wild herbs and flowers. Mown paths wind down to a hand-crafted, oak framed hut with a Chestnut shingle roof, based on a Saxon Romanian field barn design, which houses loos and hot showers (no coins or tokens required!). There's also a covered dishwashing area with hot water, power points and a fridge and freezer. 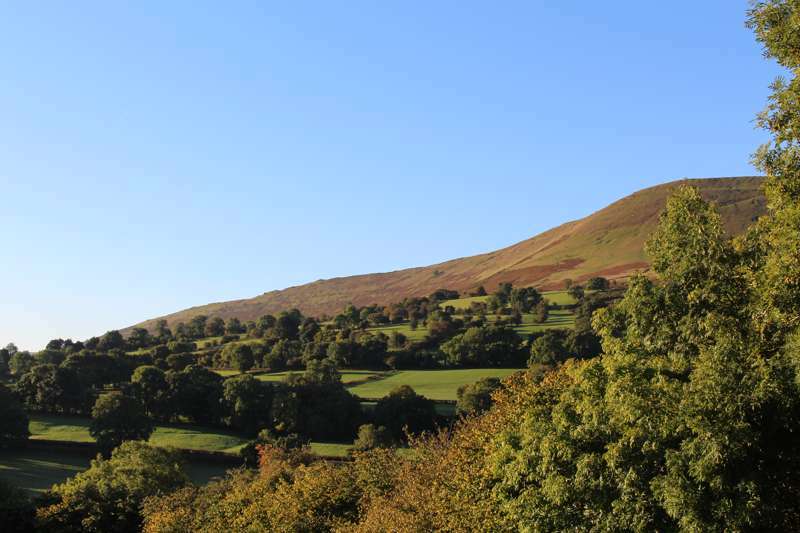 Travel by car, walk or cycle, via public footpaths, bridleways and quiet country roads to Hay, the Golden Valley and over the Black Mountains and the Offa's Dyke footpath to Llanthony, Llanveynoe and the secluded Olchon Valley. For latest availability and best prices for Chapel House Farm, please use the Date Search above. A hand-made, oak-framed, building houses 2 sets of showers and loos, and in one of the camping fields is a compost loo. There’s a covered area with a sink and hot water for washing dishes, a fridge-freezer and fridge and power points for hairdryers and charging phones etc. Follow the mown winding paths to a games pitch and beyond to woodland where dens can be made. Complimentary firepits provided. Logs, kindling and firelighting packs are available. The small on-site shop sells local beers, ciders and soft drinks. Herefordshire's world-famous literature capital Hay-on-Wye is a scenic six-mile drive away. Coincide your stay at Chapel House Farm with the annual Hay Festival which hits the town every May. There's no end to the walking trails round here with the The Black Mountains, Brecon Beacons, Shropshire Hills and Offa's Dyke Pathall eminently accessible from the site (the latter can be accessed from pretty much the campsite doorstep).The Golden Valley drive to Llanthony, Llanveynoe and the secluded Olchon Valley comes highly recommended. 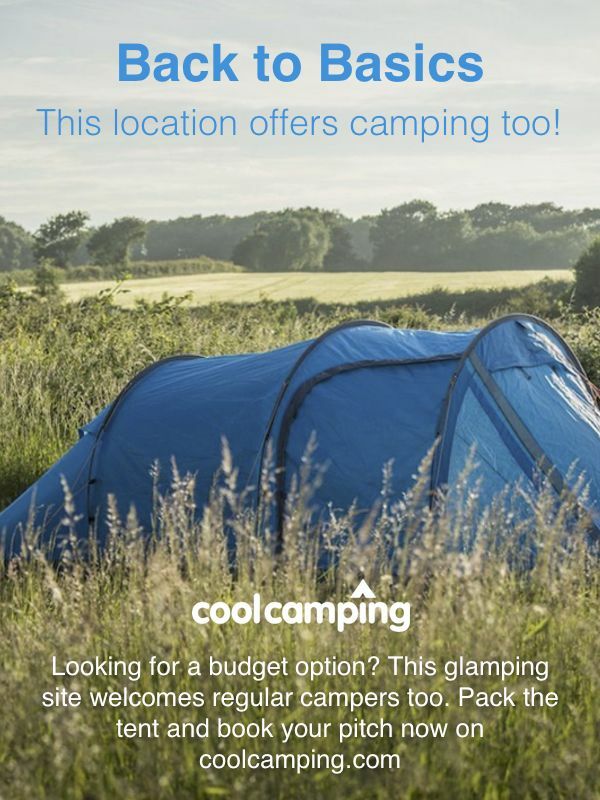 Your hosts can put you in touch with local bike hire outlets and there's outdoor activities available in Craswall. Apart from our own regular pizza night and bottle shop, the nearest local pub is The Bridge Inn (01981510646) in Michaelchurch Escley, a charming 16th century riverside inn that serves an array of local ales and a sophisticated meat-rich menu, as locally sourced as possible. It was awarded Herefordshire's Best Pub in 2017 and it's clearly deserved. Elsewhere, the similarly award-winning White Haywood Restaurant (01981 510 324), serves their own farm-reared meat in a converted 400-year old stone barn. Hay-on Wye and the surrounding villages boast an array of great pubs, restaurants, delis and independent food shops – just ask Simon and Anita for their personal recommendations. Be sure to stock up on provisions for cooking on the firepit back at camp. From Hay-on-Wye (approx 6½ miles): Follow Forest Road, signposted to Capel-y-ffin. After two miles bear left at the fork in the road signposted to Craswall. After 4½ miles turn right into the campsite field. You will be driving steadily uphill from Hay. The road eventually levels out to run parallel with the mountain then descends – the campsite field is on the right on the descent, about half a mile downhill from Pentwyn farm. From Longtown (approx 6½ miles): Follow the road uphill to Craswall. After 6 miles you will get to the Bulls Head pub (temporarily shut), a large white building on the right, the mountain is on your left, bear right and downhill at the pub (in the direction on Hay-on-Wye). The road crosses a stream at the bottom. Chapel House farmhouse is the first on the left as you drive uphill. Carry on driving up the hill, past the church on your right, and on up for another quarter of a mile, the entrance to the field is on the left. The nearest train stations are at Hereford (18 miles) and Abergavenny (17 miles). There are also buses from Hereford to Hay-on-Wye (no 39) and infrequent buses from Hereford to Craswall. 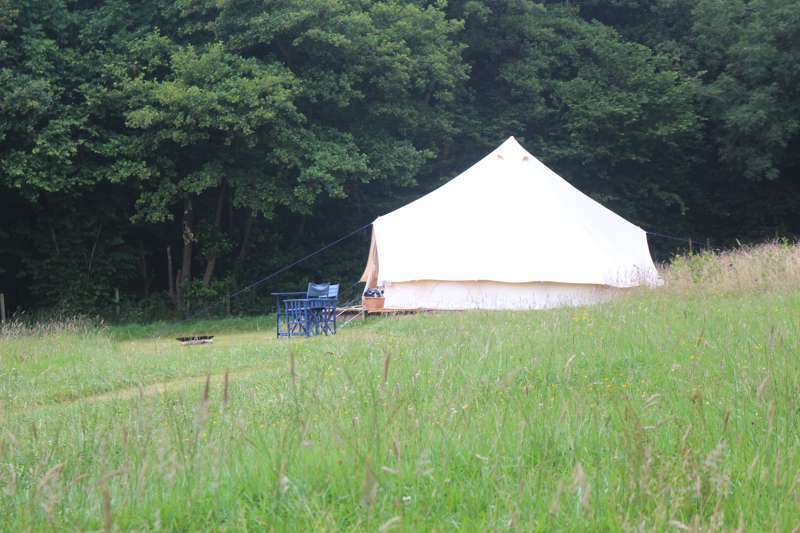 10 grass camping pitches across 10 acres of wildflower fields, plus a single bell tent (sleeping up to 4) in a separate, private meadow. 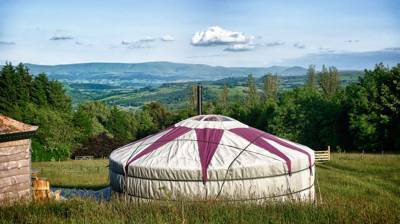 A yurt glamping site run by genuine yurt glamping experts on the edge of Builth Wells in Wales near the River Wye.